The Holy and Great Council of the Orthodox Churches is at the same time a rare event, and the beginning of normality, because synodality is a canonical rule of the life of the local Churches, in order to express the unity of Orthodox faith, of sacramental life and of canonical discipline of the One, Holy, Universal (Catholic) and Apostolic Church. 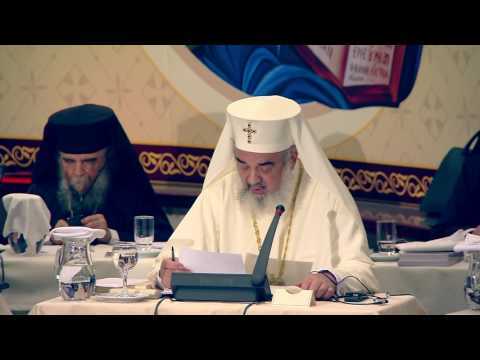 If synodality is a canonical rule at local level, it must also be a rule at universal pan-Orthodox level. Synodality or conciliarity is fulfilled in the sacramental concelebration of the Holy Eucharist, in order to express both the unity of Orthodox faith and the Mystery itself of the communion of the Church with her Head, our Lord Jesus Christ. The autocephaly of the Orthodox Churches express their administrative and pastoral freedom, while the pan-Orthodox Eucharistic commemoration and pan-Orthodox synodality (conciliarity) express the unity of the entire Orthodoxy. The pastoral and missionary ministry of the Church must take into account today’s problems and challenges. Nevertheless, the principal goal of the ministry of the Church is the sanctification and salvation of humans, which means to acquire eternal life in the love and light of the Kingdom of the Most Holy Trinity. In this regard, the Council does not have to formulate new dogmas or new sacred canons, but rather to have an actual pastoral and missionary signification, so as to witness Christ’s love for His Church and for the entire humanity. The Holy Spirit is the Spirit of Truth and Communion. If we profess together the true faith, then we receive the joy of communion in the love of the Most Holy Trinity, Whom we celebrate today.